In the summer of 1960, Ernest Hemingway was in Madrid writing an epilogue to a series of articles he had completed for Life magazine on Antonio Ordonez and Luis Miguel Dominguin, the top matadors of the 1959 bullfighting season. The three-part series was titled “The Dangerous Summer” and published in September, 1960. He wrote the epilogue in order to bring “the careers of the two matadors up to date.” Less than a year later, Hemingway was dead. 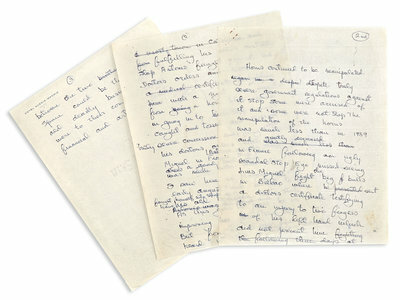 Now three manuscript drafts of that epilogue are headed to auction in New York on April 17, billed as “the final published words of Hemingway,” according to the auctioneer. In book form, The Dangerous Summer appeared posthumously in 1985 and is considered Hemingway’s final book. The manuscripts were last seen at auction in 1995, and to quote Doyle’s catalogue: “Such manuscripts are extremely rare at auction.” In this lot, estimated at $30,000-60,000, the winning bidder will nab not only the three drafts but a signed note recording translations, two telegrams, and the three original issues of Life magazine where “The Dangerous Summer” first ran. In the summer of 1960, Ernest Hemingway was in Madrid writing an epilogue to a series of articles he had completed for Life magazine on Antonio Ordonez and Luis Miguel Dominguin, the top matadors of the 1959 bullfighting season. The three-part series was titled "The Dangerous Summer" and published in September, 1960. He wrote the epilogue in order to bring "the careers of the two matadors up to date." Less than a year later, Hemingway was dead. Now three manuscript drafts of that epilogue are headed to auction in New York on April 17, billed as "the final published words of Hemingway," according to the auctioneer. In book form, The Dangerous Summer appeared posthumously in 1985 and is considered Hemingway's final book. The manuscripts were last seen at auction in 1995, and to quote Doyle's catalogue: "Such manuscripts are extremely rare at auction." In this lot, estimated at $30,000-60,000, the winning bidder will nab not only the three drafts but a signed note recording translations, two telegrams, and the three original issues of Life magazine where "The Dangerous Summer" first ran.